Offering discounted products through daily deal and flash sale websites has its drawbacks — i.e., low margins and disruptive to operations. However deal and flash sale sites may help you quickly grow your database, get rid of old stock, and gain some extra search engine optimization benefits. A strategic participation with deal websites could be beneficial, particularly if you’re able to get new customers to return. Here is a list of deal sites. There are daily deal websites for local and national services, daily deal product sites, and curated flash sale shops. There are also coupon sites for merchants, to offer discounted products. All of these sites welcome potential partners. Woot! is the original “one day, one deal” site for discounted products. The site now features Today’s Woot daily deals, as well as Woot Plus deal events. There are daily deals in over ten categories, including Sport.Woot, Kids.Woot, and Home.Woot. There’s also a Deals.Woot, where retailers can offer their own deals or community members can share what’s cheap and where. LivingSocial is a daily deals site offering deep discounts on local goods and services in more than 300 cities across the globe. 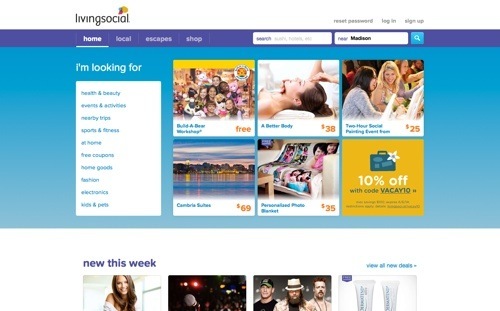 LivingSocial has sales in nearly 100 different deal categories. 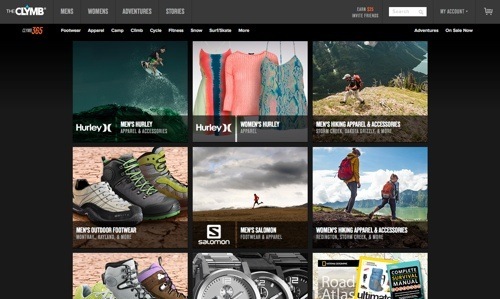 It also offers online coupons and sales from nearly 25,000 brands. The merchant center has tools for partners to see performance metrics, view customer data and feedback, and track payments. 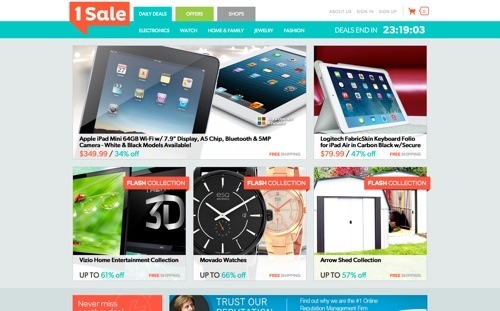 1Sale is another daily deals site that has expanded beyond its beginnings as a single sale item per day site. 1Sale features daily deals, 1Sale shops, and sell-offs in electronics, home and family, jewelry, and fashion. Merchants can submit a product or service deal in the 1Sale Community section. Groupon is a global leader of local commerce. 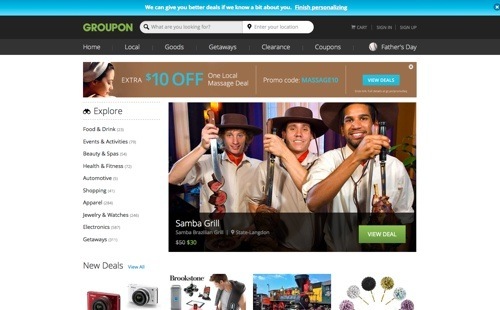 Groupon Local offers local deals on goods and services. Groupon Getaways offers travel deals. 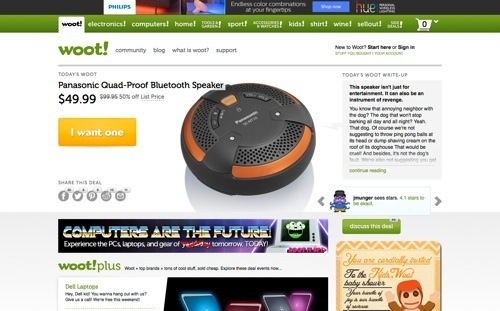 And Groupon Goods features curated selections of electronics, fashion, home furnishings, and more. Groupon’s mobile apps allow users to buy and redeem deals directly from their smartphones. Its merchant center features tools to run a campaign, track the success of a promotion, and gain valuable customer insights. Scoutmob is a deal site for unique goods, as well as local deals in 13 cities. 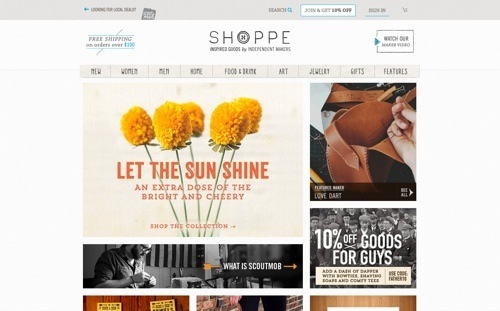 Its Shoppe connects users to independently made goods. For featured products, Scoutmob seeks 50 to 250 bulk products and 10-20 time-intensive low-quantity products. Scoutmob’s mobile app features pop-up deals and a curated list of local events. Scoutmob has more than one million users. SweetJack is a daily deal site from Cumulus Media, America’s second largest operator of radio stations. 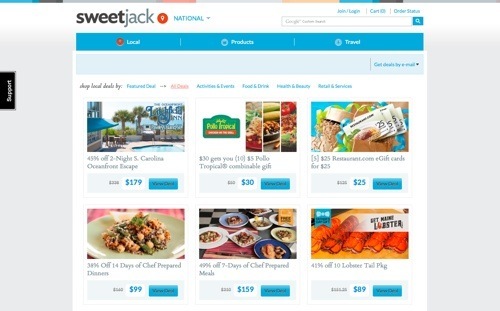 SweetJack offers deals on products, local goods and services, and travel destinations. SweetJack makes it easy for merchants to get featured locally and nationally, with dedicated support and its network of radio stations for promotions. Dealfind provides deals in cities across North America. 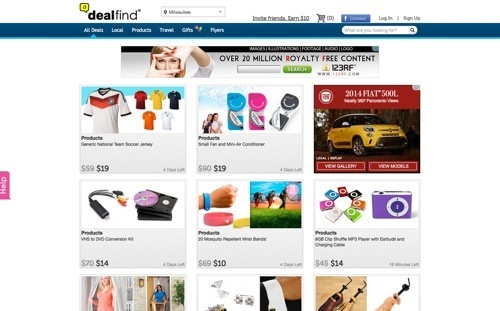 Dealfind features local deals, product deals, travel sales, gifts, and coupons. Based in Toronto, the company has an established Canadian presence, in addition to its coverage of U.S. cities. 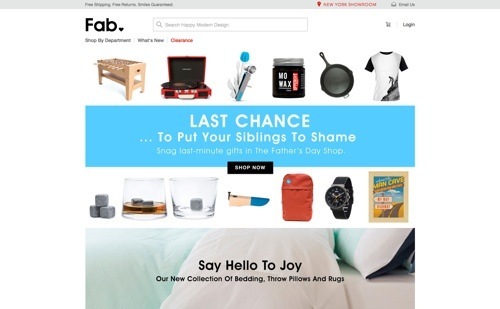 Fab is a deal site that’s dedicated to everyday design. It features flash sales of selected products, curated by its team of design enthusiasts. Fab procures many of its products directly from designers and has products that are available only on Fab. Gilt provides flash sales on designer label collections at up to 60 percent off. Gilt features deals in women, men, baby and kids, home, and travel. 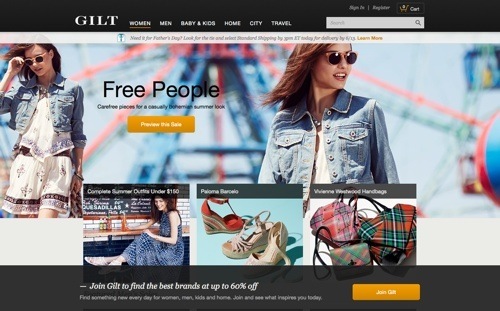 Gilt also has a local deals site, Gilt City, that offers deals in 13 cities. Membership is free. Zulily features flash sales on curated collections for the entire family, including clothing, home decor, toys, gifts, and more. Zulily seeks to offer handpicked selections of boutique brands. Zulily events open at 6 a.m. and usually last 72 hours, though some sales last only a single day. Membership is free. The Clymb offers flash sales on collections of outdoor gear, trend-setting apparel, and human-powered adventure travel packages. The Clymb is for people with active lifestyles or people who are inspired by the great outdoors. Membership is free. 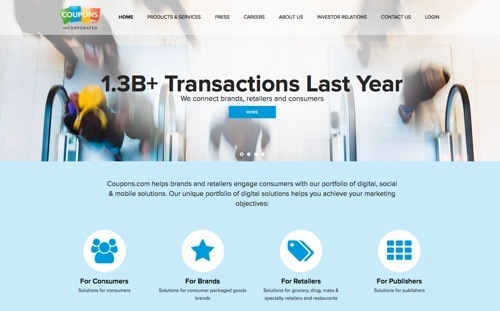 Coupons.com is a leader in digital coupons, including online, printable, social, mobile, and loyalty card promotions. It offers promotional and media solutions for merchants, such as its digital affiliated network, interactive coupon aggregators, the Coupons.com gallery and more. Drive ecommerce traffic and sales with digital offers that consumers redeem online or via mobile. 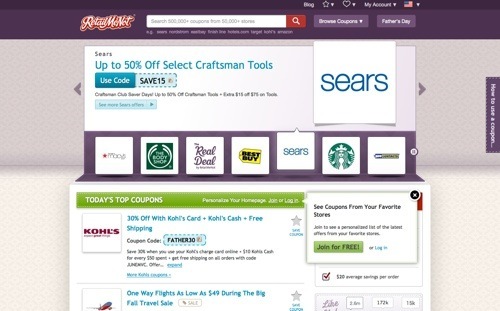 RetailMeNot operates a digital coupon marketplace. The company enables consumers to find hundreds of thousands of digital coupons from retailers and brands. According to RetailMeNot, its websites had more than 590 million visits in the last 12 months and its mobile apps have been downloaded nearly 16 million times.